Hi Darlings. Taking a break from sniffling my nose, coughing out my lungs and my tickling cough. 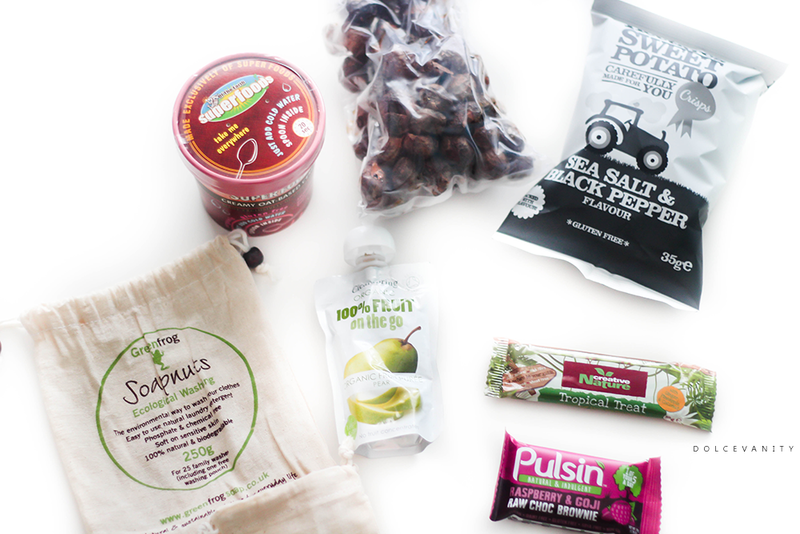 I've had a chance to delve through my January TheVeganKind box and trial some nibbles. I unfortunately couldn't get to do last months box (amongst other post) which was unfortunate as it was a nice box and I even ordered some stuff from that box for gifts and for myself. I will show you in a post at a later date. Power of Red...Strawberry, goji and beetroot. 100% organic gluten free ingredients filled with antioxidants and phytonutrients. This is a quick and easy on the go breakfast, take this on your travels to work or into work for something that's ready within 20 seconds by adding hot or cold water, put the lid back on and wait 20 seconds and you've got a creamy oat cereal. You should know I'm all for soap nuts by now but I never knew Greenfrog did them, very reasonably priced for something that can be used multiple times. Soap nuts are a natural and chemical free way to do your washing. Hectares Sweet Potato Crisps...I love sweet potato, well potatoes in general so any excuse, these are very nice, they have that mild spice with the peppers don't taste much of the salt. I find them a tad drying in the mouth but other than that they are moreish and have a good munch to them. Ginger, pineapple and coconut. You can really taste the coconut and it's delicious and a good snack in between meals or when your just feeling a bit pickish. My nan now pinched the rest of my Creative Nature Bar lol. It's very rich due to the raw chocolate. It's edible but for me in pieces, I don't mind chocolate but rich chocolate is too rich for my blood. I've found this to be same with most the Pulsin bars I have tried. Purée always reminds me of baby food, can't lie. I read on the Clearspring website these can be used as toppings, snacks or even frozen to make a sorbet. While trying this Sweep made a show and enjoyed a lick of the purée. It's definitely 100% pears, I'm not sure I can get my head around the purée just yet but I suppose it's not much different to a smoothie. Did you get TheVeganKind box this month? Btw don't forget it's Veganuary.